(PhysOrg.com) -- The search for habitable planets similar to Earth has routinely focused around active nuclear burning stars. However, in a recently published paper by Eric Agol from the University of Washington, the idea to expand the search to white dwarfs shows promise. A white dwarf star is similar to the size of Earth and is believed to be in the final stages of a stars evolutionary process. It is no longer supporting nuclear reactions and is essentially only a glowing core. Unlike our sun, a white dwarf is no longer producing reactions, and is in a cooling process. Although cooling, a white dwarfs surface temperature is around 5000K. 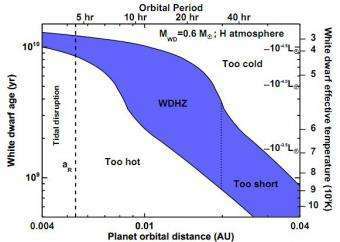 According to Agol, the surface temperature of an average white dwarf would be able to provide a habitable zone for planets within an orbit no closer than 0.01 AU. Agol has created a chart illustrating a white dwarf habitable zone, and he defines a continuously habitable zone as one with a range of orbital distances habitable for a minimum duration. This minimum duration could last in excess of 3 billion years. The one problem with these habitable planets is that they would have a permanent day side and a permanent night side, similar to our moon. This would be caused by the short orbit and the probability of tidal locking. About five percent of all stars are white dwarfs, and there are at least 15,000 within 300 light-years of earth. Agol proposes that these possible planets could completely eclipse their white dwarf, making it possible to locate them using ground based telescopes. He also proposes that the use of the Large Synoptic Survey Telescope (LSST), currently under construction in Chile, could provide even better options for locating white dwarf habitable planets. Agol believes that by utilizing a network of ground-based telescopes over a two year period, over half a dozen habitable planets could be located orbiting a white dwarf. Solar systems around dead Suns? The writer has thought is this, of course. Several ways of forming a planet in the area after white star formation, is given in the Introduction in the article. The FIRST extra-solar planets ever found anywhere and CONFIRMED were around a NEUTRON Star sometime in the mid 1990s. One is roughly the same size of Earth. Google neutron star planets, and you should find the info. While the discovery was quickly buried under more tantalizing discoveries of giant planets orbiting more normal stars, this fact makes this guy's idea extremely plausible, and it's only a lack of imagination and interest among astronomers that has stopped a search like he suggests. Nik, you're right, the author states that the red giant phase of the star would engulf any planetary bodies within the habitable zone. He then goes on to say that planetiods can form from gas near the white dwarf, captured bodies, or interactions between binary stars. Just in case you don't feel like digging through the report. Unfortunately, after 3 billion years the white dwarf would have cooled significantly. We are looking for a planet that is created towards the inner part of the habitable zone in order for it to remain within the zone for 3 billion years. I suspect this shrinks the possible orbits somewhat. ...it's only a lack of imagination and interest among astronomers that has stopped a search like he suggests. It's not really a lack of imagination, but more a lack of interest, or bang-for-buck that more white dwarfs aren't being targeted. The prospects of finding habitable planets around such bodies is vanishingly poor. You might find an orbiting rock or something, which would be of scientific interest, but not in the way the article alludes - finding a habitable planet with a potential biosphere. With no nuclear reaction, there really shouldn't be a solar wind to maintain planetary orbits. The planets should be slowly moving inward towards their star. Granted that we are talking of long spans of time, but as the star cools its habitable zone will also be shrinking. This guy is a moron, sorry but he is. How in the HELL are you going to find a "habitable planet" around a star at that close a distance that's gone through its red giant phase. Not all that common, one would expect.. But that said, there has been discovered (as previously mentioned) planets around a neutron star, which would seem even less likely. I'd say your characterisation of this guy as a 'moron' is probably a bit harsh, huh. I disagree with the assumption that stellar wind is a significant factor of planatary orbits. Indeed my best example of this are the dwarf planets in the Oort cloud and Pluto... if you were right then Pluto should be moving inward ... However the Kepler equations tell us that orbital speed is one of the primary factors along with mass, per the gravity equations. Stellar wind is minimal and is not included in most of the routine equations to predict planetary postion, or rotation. Having a planetoid form somewhere and a HABITABLE planet are two entirely different things and would have to form in very different ways than planets did in the initial formation of the solar system. I've seen nothing to suggest that the composition and formation of any "planets" after a red giant phase would be anything like the initial formation of a system around a G type star. They are defining "habitable" as a planet within a certain range of orbital distances for a minimum of 3 billion years... He's basically saying that there is the possibility of planets within these parameters, and that they should be relatively easy to detect. Why take such umbrage? Why take umbrage when someone says the Earth is flat? Maybe I shouldn't be so irritated when scientists throw around words carelessly. I guess that it comes from somewhere inside me that when a person in "authority" in scientific circles says "habitable" they ACTUALLY MEAN IT....silly me. white dwarfs would be a good canidate for a dyson sphere since they are stable and can last the lifetime of the universe. Sure, for the orbits of Pluto or the Oort cloud a solar wind is negligible, but a solar wind, or the lack thereof, should be an orbital factor for planets within a habitable zone. Actually, if a star is this old it's rotation should be quite slow. If a planet orbits its star at a rotation faster than the star's rotation then it tends to get pulled in. This is the opposite of what is happening with our moon. Because our planet rotates faster than the Moon orbits the Earth it is being slowly pushed into a higher orbit. Well.. Because the earth is not flat, obviously. We know it to be fact. And I fail to see even the possibility of a HABITABLE planet around a white dwarf. Nothing I've read in the article addresses any of the obvious problems with such a theory.